Shhhh.... I skipped "X." So sorry. I could not come up with an author, or a book, beginning with X that I felt comfortable discussing. So, here we are on "Y!" My favorite thing about homeschooling has been discovering new-to-me authors of children's books. I wasn't familiar with William Steig's name, but once I started looking for his books, I realized I was familiar with more of his work than I'd realized. 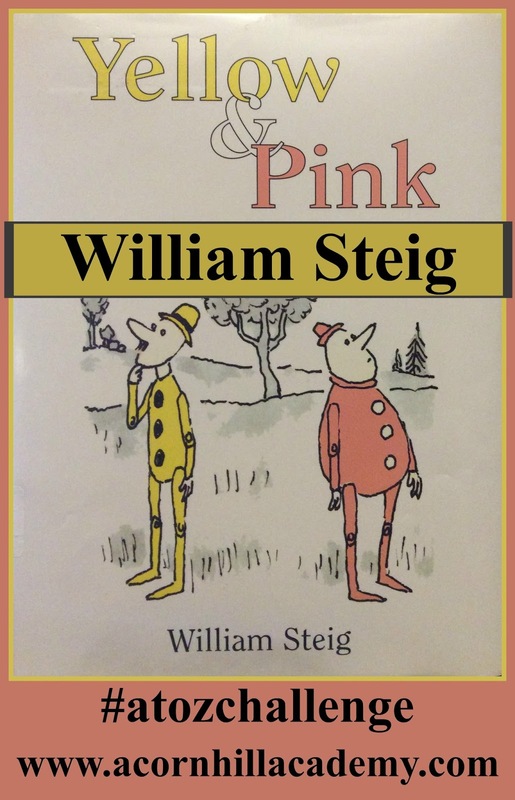 William Steig was born in Brooklyn, New York in 1907. His parents both appreciated the fine arts, and he received his first lessons in art from his older brother. During the Great Depression, his father went broke, and it fell to William to support his family. He began selling his art work. He eventually became known as "The King of Cartoons," and drew 2600 cartoons and 117 covers for the New Yorker. He wrote his first children's book, CDB! when he was 61 years old, in 1968. He passed away in Boston, Massachusetts in 2003, at the age of 95. I love his illustrations - they are simple and engaging. If you look at any of his cartoons, you will see his signature style carried over into his children's books illustrations. I'm first heard of Yellow and Pink when I began homeschooling. We used My Father's World kindergarten program, and it was listed in the booklist for Creation studies. It was hard to find, even then. If you can believe it, I just found a copy at a library sale for $0.25. TWENTY FIVE CENTS. Take a look at the used prices on Amazon, and you will see why this makes me so happy! Yellow and Pink is a lovely little book about two puppets, one yellow and one pink (imagine that! ), who become self-aware as they are lying on newspapers in a meadow, waiting for their paint to dry. They begin to wonder how they came to be, and come up with interesting, implausible explanations. Their creator comes to find him, and they have no idea who he is. It's a great little story, and Christians interpret it as a story about God creating man. I've read a bit about Steig, and from what I can gather, he was an evolutionist. It's an interesting conundrum, to say the least, but it's still a great story, and each of us will take from it what we will, yes? Unfortunately, this book is not currently in print, but it IS available as an ebook (link below). He wrote many other picture books. Sylvester and the Magic Pebble is one I remember from my own childhood, and I was delighted to rediscover it and share it with my children. It won a Caldecott Medal, AND it was banned because the police in the book were portrayed as pigs (all the characters are animals and pigs are drawn doing other things as well). Did you know he wrote the book Shrek, upon which the movies are loosely based? I had no idea until I was researching for this post! Doctor De Soto, Brave Irene... the list goes on. Mr. Steig wrote some chapter books, too. A friend recently recommended The Real Thief, which my son and I have begun reading - it's a great story! There's also Abel's Island, a Newbery Honor Book, and Dominic. I hope you will take a look at some of Mr Steig's books, if you're unfamiliar with him. I don't think you'll be disappointed.